On Wednesday, the Fung Global Retail & Technology team attended the third and final day of the inaugural Shoptalk conference, which its organizers describe as “the tech event for nextgen commerce.” Day three of the event was the most dynamic, featuring some healthy competition among startups. 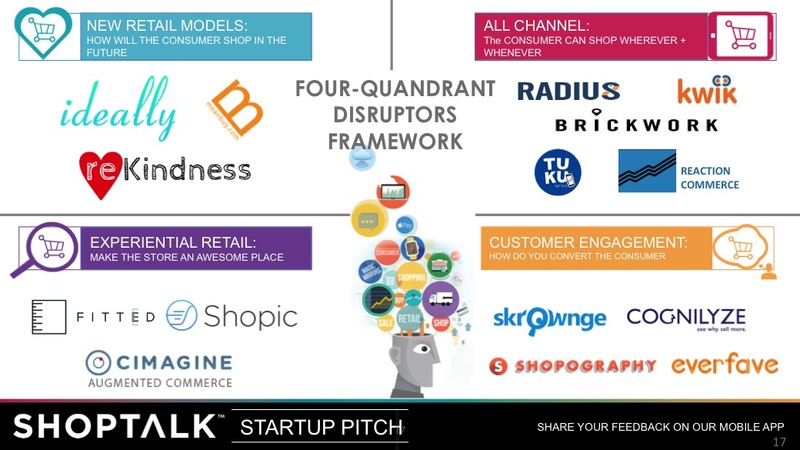 I emceed Shoptalk’s startup pitch competition. Earlier in the day, we also heard about online-to-offline retail from Bonobos CEO Andy Dunn. After two days of discussing the innovations and challenges that are disrupting the retail world, we joined many Shoptalk attendees on Wednesday morning to meet the startups that may help define the future of retail. They focus on everything from moving e-commerce to the next level to creating brand new commerce platforms. After opening the event with a presentation on the current state of the retail environment, I moderated the competition, in which each of the 15 startups had three minutes to pitch and three minutes of Q&A before a panel of three judges. I classified each business under one of four categories; each representing an area of focus among retailers as they adapt to the realities of digital commerce and changing customer preferences: new retail model, all channel, experiential retail or customer engagement. Businesses under the new retail model category include online fashion barter communities and name-your-price models. The all channel category includes see-it, buy-it models, click-and-arrive systems and “e-commerce in a box” offerings. The experiential retail category includes self-checkout models, augmented reality, and fitted solutions. Customer engagement refers to models that use gamification, artificial intelligence, the influencer marketplace, and the “evangelize and thrive” strategy. 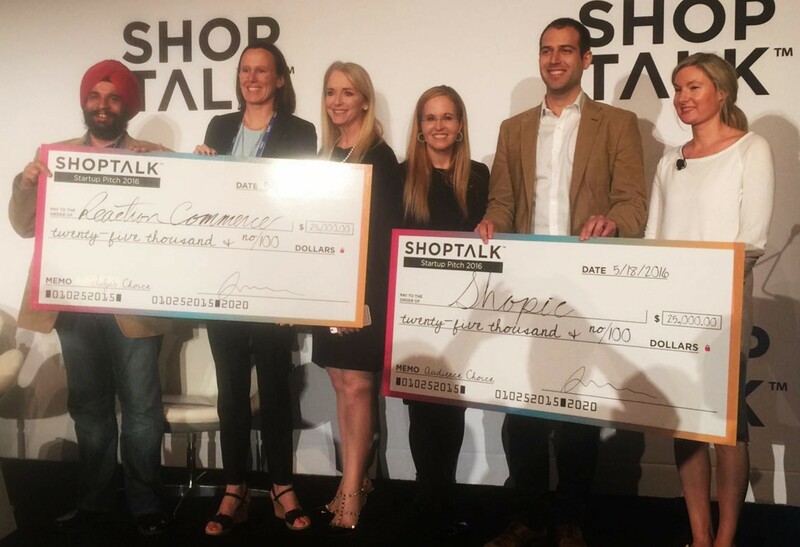 At stake were two $25,000 prizes, one awarded based on votes from the judges and the other based on audience votes registered via the Shoptalk app. Each startup was assessed on the retail challenge it hoped to solve, the feasibility of its business model, its scalability and the presenter’s confidence. Reaction Commerce and Shopic! Reaction Commerce, an open-source platform that offers e-commerce solutions, was selected by the judges, and Shopic, an app for expediting self-checkout, was chosen by the audience. Below, we briefly introduce the two winners and the other 13 competitors, listed according to my categorizations. Ideally wants to ensure that consumers do not overpay by allowing them to “name their price.” For retailers, it ensures there are no more missed opportunities from static sales prices. The app uses a preset demand curve, with merchants choosing how much revenue they would be satisfied with when products are discounted. Ideally also gathers analytics on price sensitivity for retailers. MeanBuy is a B2C e-commerce company that is also all about “name your price” and “pay what you want to pay.” The company allows customers to decide what price they are willing to pay for various products. The business model is based on flexible demand-driven pricing, benefiting from the demand side and the supply side. MeanBuy specializes in product price optimization and inventory turnover management. reKindness bills itself as an online fashion barter community that makes it simple for users to swap clothing and accessories instead of shopping for new items. Users give away clothing that they no longer wear and receive credits that are redeemable for clothes from the community closet. Brickwork Software is the first scalable SaaS platform that allows retailers to create a seamless customer path between online and in-store shopping. It is helping more than 20 retailers drive traffic from online to store, bridging the digital-to-physical gap in the customer experience. Kwik, a company that Fung Global Retail & Technology has profiled, is an end-to-end IoT platform that allows retailers and brands to provide “click and arrive” services. It offers a white label version of Amazon Dash, allowing consumers to automatically reorder items from a wide range of brands. Radius8 is a smart online-to-offline platform that is cloud native and allows retailers to activate the contents of brick-and-mortar stores for easy online discovery. Reaction Commerce is an open-source platform that offers an e-commerce solution for businesses. The platform is real-time reactive, allowing for drag-and-drop merchandising and dynamic pricing/promotions. It is fully mobile responsive, allows in-line content editing, and offers the ability to create or modify platform themes. It also includes an integrated library of apps and analytics with event tracking. TUKU provides mobile opportunities for in-store marketing based on location. The online-to-offline technology allows products on shelves to “speak for themselves,” giving shoppers all the information they need to make informed purchases. Cimagine Media provides retailers with a markerless augmented-reality platform that can be easily integrated into existing platforms. It also provides consistent cross-channel experiences. Fitted Solutions, which launched at Shoptalk, is a sizing technology company that can be used by online retailers to provide better-fitting shoes and clothing. The company gave a live demonstration of its foot-scanning technology as part of its presentation. Shopic, an app for expediting self-checkout, lets users skip checkout lines by scanning and paying for items with the app. The framework is available for iOS or Android, and can also be integrated into a retailer’s own app. Cognilyze is a psychology-based, motivation-driven recommendation engine that uses artificial intelligence. It focuses not on what consumers buy, but on why, in order to provide personalized product suggestions. Everfave is a social and mobile referral platform that enables customers to spread the word and refer businesses to their friends. It allows customers to help companies “evangelize and thrive,” as Weinswig put it, via email, text and more than 25 social media networks. Skrownge creates mobile apps that entertain users with retailer prizes. It uses gamification to provide relevant brand experiences to customers along with personalized incentives, helping to drive retail sales. Shopography is a product discovery and purchase platform for just about anything. The company will launch an influencer marketplace shortly. We also attended sessions with Andy Dunn, CEO, Bonobos; Casey Carl, Chief Strategy and Innovation Officer, Target; Katrina Lake, Founder and CEO, Stitch Fix; and Mike Karanikolas and Michael Mente, Co-Founders and Co-CEOs, Revolve Clothing. 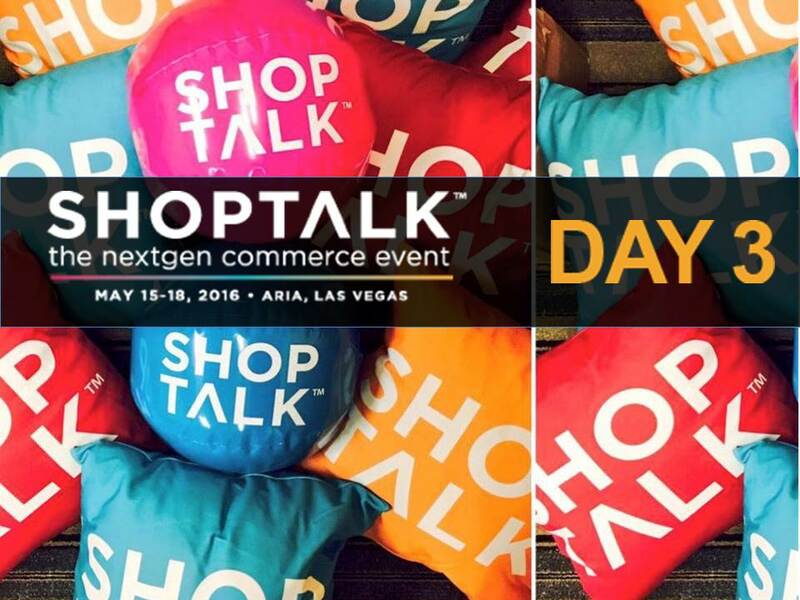 Read our report on Day 3 of Shoptalk for all the details. Miss the first two days? Check out our Day 1 and Day 2 reports.